A small (8m x 4m) pitch with its own fire basket. Ideal for small tents of 2 to 4 people. NOT suitable for Camper Vans. A splendid elevated grass pitch approx 14m x 6m looking northward accessed by steps.NOT suitable for camper vans. 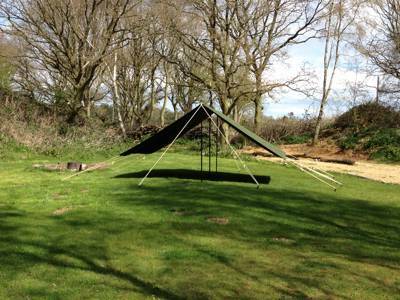 A 19m x 7m elevated pitch with its own firebasket and hammock point. NOT suitable for Camper Vans. A 21m x 11m elevated pitch with its own fire basket overlooking fields. Our most secluded and popular sheltered pitch set in a 5m x 4m turfed sand cove with its own fire basket. 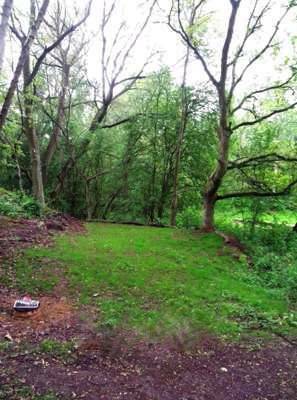 Deep in the wood close to WW1 trenches this 23m x 15m pitch has its own fire basket. It will take hammocks and tree tents. A 7m x 16m ground level pitch with its own fire basket. 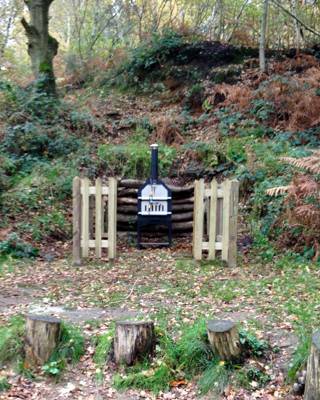 A secluded 16m x 7m pitch with its own fire basket. A 16m x 15m open easily accessible part of the Glade. 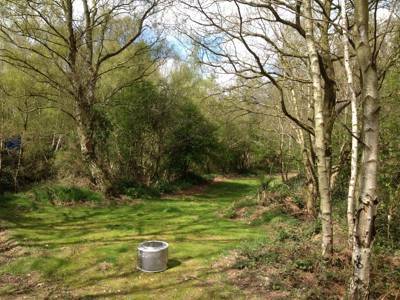 The West End of The Glade has a fire basket in an area nestling under a Silver Birch. 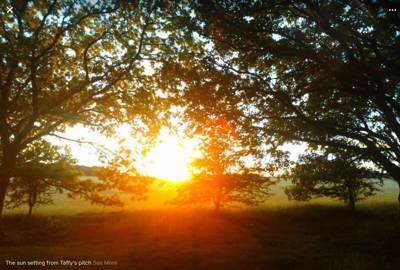 The North Half of The Hollow provides a sheltered 25m x 24m pitching area with a firebasket. For the whole area please also book the South End. It’s not often you can pitch somewhere steeped in wartime history. Dreamy Hollow is home to three and a half acres of First World War training trenches, with evidence indicating these were dug by The Lovat Scouts back in 1915. “It's got a character about it that just grips you”, describes campsite owner Nigel Day who first believed the tracks were drainage ditches, before aerial photographs taken by the RAF revealed its vast, snaking network. 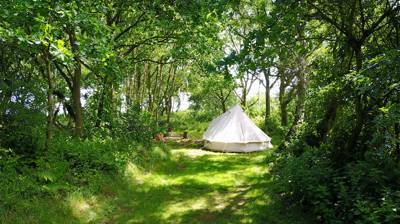 Today, Dreamy Hollow is a wonderfully withdrawn, back-to-basics campsite, perfectly positioned to explore the beautiful North Norfolk Coast. The seven pitches at Dreamy Hollow are as individual as the campers who pitch there. 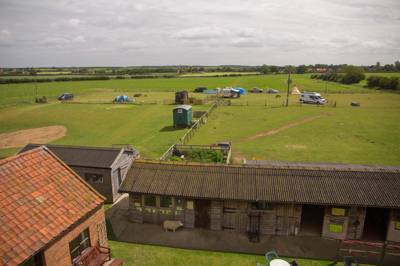 Some are secluded and sheltered, whilst others are elevated with fantastic views across the open Norfolk countryside. ‘The Hollow’ is a firm favourite, so be sure to book well in advance. 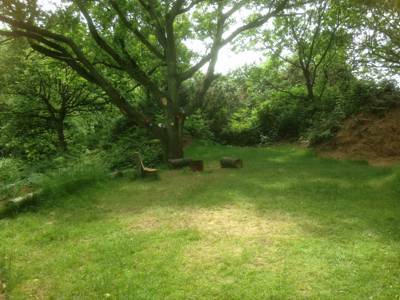 This peaceful, south facing space has it's own communal fire-pit and is close to the WC's and drinking water point. ‘The Glade’ is a superb choice for families and groups, with ample room (29m x 27m) to accommodate two huge tents (up to 12 person), or numerous smaller tents, providing they are six metres apart. Facilities? Okay, they are not quite up to Savoy standards, however the invigorating ‘Jungle Showers’ are fun and always immaculately clean. There’s an age-old saying that residents of Norfolk have “one foot on the land and one in the sea”, however there’s an interesting spread of sights in between. The picturesque Norfolk Broads beckon for boaters, bird-watchers flock to its marshy nature reserves and the county’s unspoilt coastline is bordered by flint houses and boats hauling in today’s fresh catch. And when civilisation calls, campers can head for the vibrant city of Norwich. In addition to a castle, cathedrals and medieval churches galore, Norwich has a decent selection of lively pubs, cafés and restaurants. 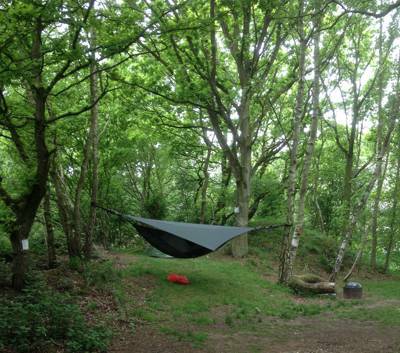 Set in one of the most sparsely populated parts of England, Dreamy Hollow is ‘proper camping’ and an ideal destination to get away from it all. 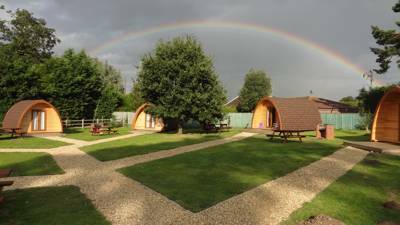 Together with welcoming Nigel, the site is run by a Christian Limited Company with a vision to develop neglected land and turn it into a unique, secluded camping experience. 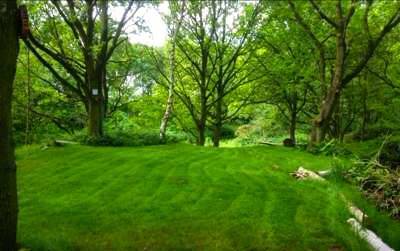 And with beautiful woodland pitches and a dramatic history, we think they’ve succeeded. 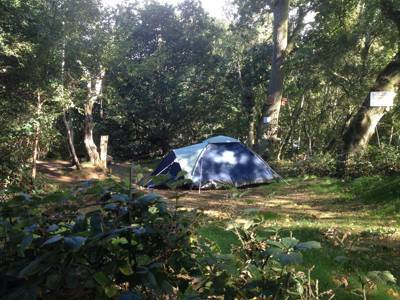 A unique woodland campsite with secluded pitch's. 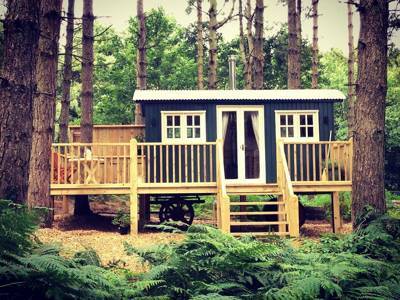 Ideally placed for beaches on North Norfolk's area of Outstanding Natural Beauty. Tours and experiences of our very rare, possibly unique WW1 Lovat Scout training trenches with warden led tours and WW1 Exoeriences. New for 2019 is our WW1 Officers Bunker, Sgt Taylor’s, which sleeps 4. All our pitches are all unique and have characters as varied as our campers. As Pitch’s are of different sizes and elevations check your tent size against the pitch size allowing 6m fire safety margin between tents. This mainly vehicle free site is not suitable for caravans. 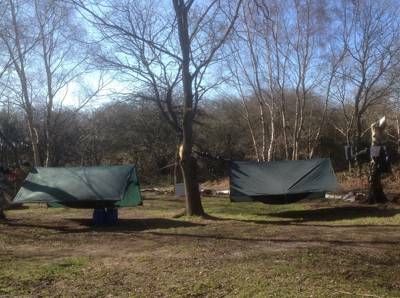 We now have two Pitch’s accessible to camper vans and trailer tents. For fire safety and so that children can safely play, all cars are parked in the car park. Barrows are available to help unload, and for heavy items wardens will assist with our little tractor and trailer. Please check carefully that the pitch you have chosen meets your needs before booking as alternatives may not be available. 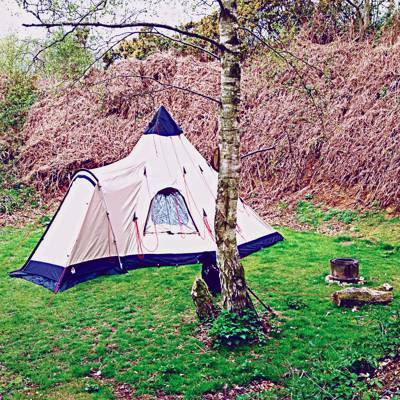 As a seasonal woodland campsite images of pitches may vary from actual. Please note ONLY Camper Glade and Jimmy’s is accessible to camper vans. For latest availability and best prices for Dreamy Hollow, please use the Date Search above. 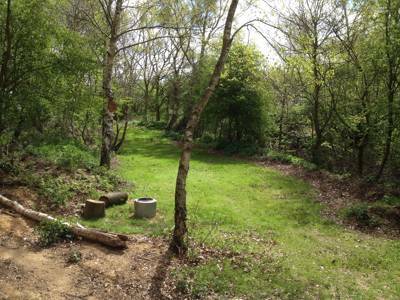 15 secluded spaces amongst 3½ acres of low density woodland. A total of 18 pitches on site of which 12 are available at any one time on average. 8 pitches are next to one another and can be merged for larger parties. 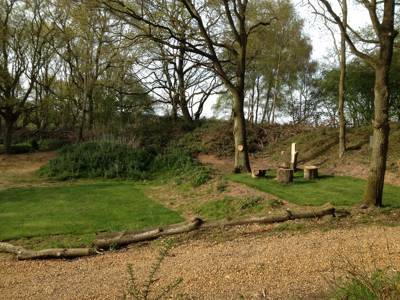 The individual private pitches all nestled amongst a sleepy woodland with a children’s Den Building area. Very much “Proper Camping”, it’s wild camping with the clean basic comforts of 2 ‘Jungle Showers’, 2 flushing loos (with washbasins) and 1 chemical toilet disposal. Campfires permitted in the Fire Baskets on each pitch if sensible rules are followed (During heatwaves Fire Service advice will determine if fires and BBQ’s are allowed) The site is 7.5 acres in total and 3½ acres of WWI training trenches, are currently undergoing a detailed archaeological survey and reconstruction. A warden's trench tour, WWI Experiences (available for groups) and Archery sessions, booking essential. Take shelter at the RNLI Henry Blogg Museum (01263 511294). The museum illustrates the history of Cromer's lifeboats and tells the story of Henry Blogg's most famous rescues. Queen Liz opens her country house at Sandringham (01485 545400) to the public when not in residence. Sandringham House, museum, gardens and woods are wonderful to muse through on a hot summers day. Also on the Royal Estate is Anmer Hall, which will be the country residence of the Duke & Duchess of Cambridge, and wee Prince George. The Victorian seaside resort of Hunstanton offers sea trips on modern boats and a WWII 'duck'. It’s a popular place with windsurfers and jet skiers alike. Blakeney beach is 19 miles away and offers more sedate sailing, and opportunities to paddle canoes up sandy creeks. 'Chelsea-by-the-Sea' as the locals call it, is the charming town of Burnham Market. Enjoy its lovely shops and tearooms. At 6 miles away it’s also the nearest place to get fuel and camping gas. Norwich is only 35 miles away and is one of the fairest cathedral cities in the land. In fact, it has two fine cathedrals, a castle and a picturesque river. You will find traditional food and ales locally in Docking at the Railway Inn or classic dishes such as burgers, fish & chips and salads at the ever-popular Kings Head (01485 578265) in Bircham Newton. The Duck Inn (01485 518330) is a traditional village pub, proudly serving a variety of local beers supplied by Wisbech-based brewers Elgood & Sons. They have a carefully selected wine list with a choice of old and new world wines. Bircham Windmill (01485 578393) is a popular local attraction and offers freshly-baked bread, a lovely tearoom and trips up the windmill. For something a little upmarket, head to the award-winning Orange Tree (01485 512213) in Thornham – it’s a culinary force to be reckoned with. Easter–end of October. Winter Camping by special arrangement. Adults £7.20–£12.90. Children reduced rate approx 75%. Up to 2 dogs free. 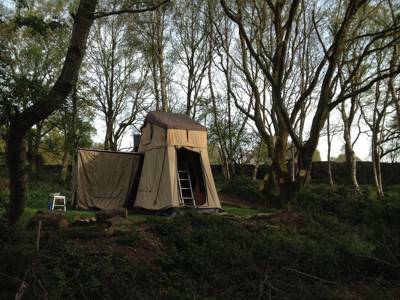 3-person tree tents £30–£50. Arriving from Kings Lynn: take the A148 to Fakenham. After Hillington exit left to take the B1153 signposted National Construction Industry Training College. At Great Bircham turn right onto the B1155 to follow the signs through Bircham Tofts and to NCITB. Drive through the NCITB campus to arrive at the crossroads with the B1454. Turn right for Fakenham and the campsite is the first on the right. Arriving from Fakenham: take the A148 to Kings Lynn. At Sculthorpe former air base, exit right onto the B1454 signposted as a Tourist Route. Drive on passing Syderstone Barmer and Barwick. After the Barwick crossroads watch out for the cranes of the NCITB on your left as you come down the hill from the Barwick crossroads. 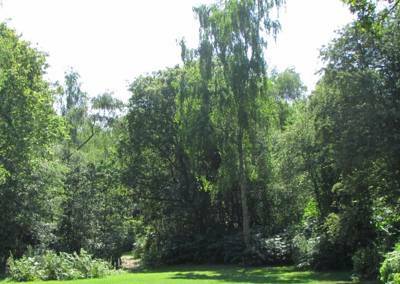 You will see the woodland on your left and the entrance is around 50m along the frontage of the woodland. If you get lost, ring 07564 226780 for help. Also it helps to text your ETA to this number. Arrivals are between 12–5pm, after which there is no warden service. King's Lynn serves as the sites nearest railway station. Go To Town Bus service calls at Monks Close stop at the rear of the site on request. The site is close to cycling routes and designated footpath/bridleway to Barwick.